The Musqueam Indian Band’s (MIB) Chief and Council established the present Musqueam Language and Culture department (MLC) in 2000, following the initial partnering with the University of British Columbia’s First Nations and Endangered Languages Program (FNEL) in 1997. The primary purpose of the partnership was to promote the development and use of hən̓q̓əmin̓əm̓ through collaborative research initiatives. Indeed, in nearly 2 decades since it began, this collaboration has produced several formal research papers, a series of elementary resource books, and a full complement of text and interactive online materials that support 4 levels of hən̓q̓əmin̓əm̓ language courses for post secondary credit. These courses are attended by both UBC and Musqueam students and serve as an excellent model for reconciliation. Within the Musqueam Administration, and in accordance with the strategic objectives set out by our Chief and Council, the Language and Culture department strives to offer sustainable programming to meet the broader constituency of Musqueam people who want to speak their ancestral language among themselves and with extended family members who live in other hən̓q̓əmin̓əm̓ communities. To that end, the MLC provides services and coordinates resources to undertakes collaborative initiatives with fellow Musqueam administrative departments as well as with external educational and cultural partner institutes to create opportunities for language engagement and expand the body of dedicated hən̓q̓əmin̓əm̓ resources. Two examples of resource development initiatives we are particularly proud of are the set of children’s books with accompanying CDs, and an online interactive map. The children’s books feature artwork and audio recordings made by Musqueam community members and represent a variety of contemporary and historical themes. The interactive map features place names within Musqueam territory, which are additionally represented through archival photographs and voice recordings, and another audio book with full colour illustrations. 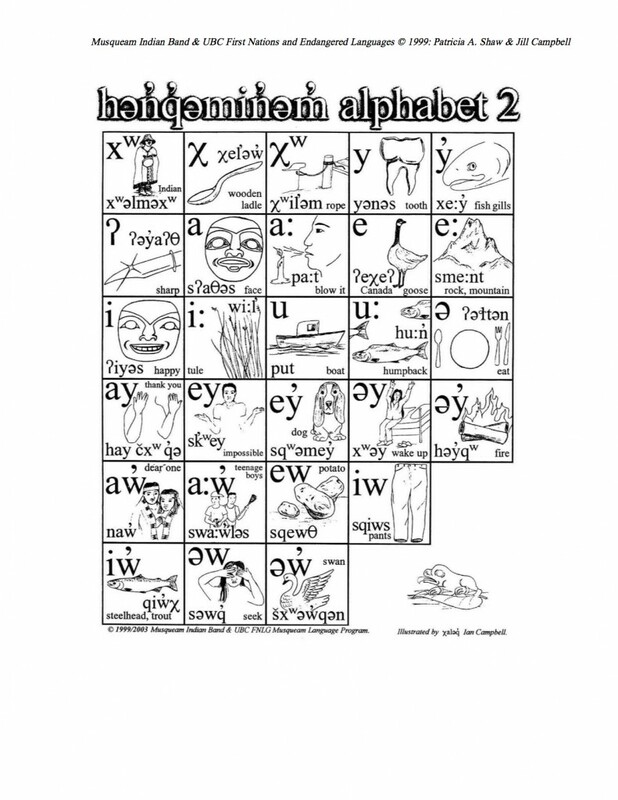 These multi media tools serve as a focus for engagement while addressing different modes of learning and are integrated through workshops and other community-based programs such as summer camps and preschool classes that serve as environments for encouraging language revitalization. We are dedicated to working diligently toward the goal of hən̓q̓əmin̓əm̓ revitalization through ongoing collaborations and research that serve to increase our capacity to hən̓q̓əmin̓əm̓qəntəl̕ ! 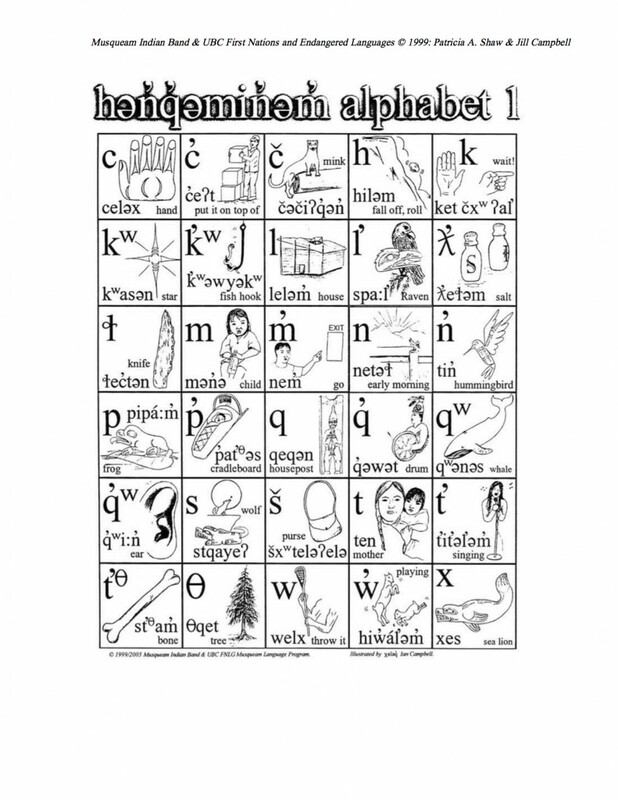 The Musqueam Language and Culture Department also contributed to the development of the teaching kit called Musqueam: giving information about our teachings. The accompany website is available here.